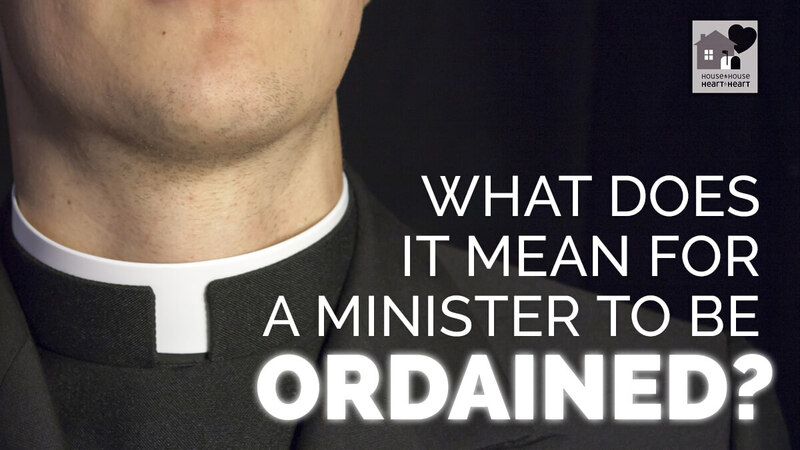 Home Bible Questions What does it mean for a minister to be ordained? Most of our religious world puts great stress on the proper ordination of ministers, but when we turn to the Bible, we find that it says very little on the subject. Under the old covenant, there were very elaborate rituals to be followed in ordaining priests, including special garments, offerings, and being anointed with oil (Exodus 28-29; Leviticus 8-9). Under the New Testament, however, there is no longer a separate priesthood as there was under Judaism. Under the New Testament, all Christians have a great high priest, Jesus Christ, who urges all Christians to perform the priestly functions to come boldly unto the throne of grace (Hebrews 4:14-16). Peter further points out that all Christians are priests before God. Ye also, as lively stones, are built up a spiritual house, an holy priesthood, to offer up spiritual sacrifices, acceptable to God by Jesus Christ (1 Peter 2:5). The word ordain implies the appointing of, or investing of one with authority. Speaking of Paul and Barnabas, Luke says that when they had ordained them elders in every church, and had prayed with fasting, they commended them to the Lord, on whom they believed (Acts 14:23). When a problem arose in the Jerusalem church, the apostles appointed seven men to serve who were apparently the first deacons (though not explicitly called deacons in the text), whom they set before the apostles: and when they had prayed, they laid their hands on them (Acts 6:6). As to a formal ordination ceremony for ministers or preachers, however, the scriptures are silent. There were a number of prophets and teachers in the church at Antioch. “As they ministered to the Lord, and fasted, the Holy Ghost said, Separate me Barnabas and Saul for the work whereunto I have called them. And when they had fasted and prayed, and laid their hands on them, they sent them away” (Acts 13:2-3). This was not an ordination to preach, however, but simply a blessing of their work. They were already preachers. The very next verse is significant: “So they, being sent forth by the Holy Ghost, departed unto Seleucia; and from thence they sailed to Cyprus (Acts 13:4).” Real ordination to the ministry comes only from God, and not from men. 2 Timothy 2:4 mentions the laying on of hands that the evangelist Timothy had received, but this was not an ordination ceremony, but the impartation of miraculous spiritual gifts from the apostles. These miraculous gifts are not available to Christians today, because there are no apostles to impart them. The words the New Testament uses to describe the preacher, such as evangelist, herald, preacher, and minister, all emphasize the work of the evangelist. Paul charged Timothy and others who would preach the word, “Preach the word; be instant in season, out of season; reprove, rebuke, exhort with all longsuffering and doctrine” (2 Timothy 4:2). Preachers under the new covenant are ordained to preach by the Lord, not by human councils or synods. Elaborate rituals of ordination are out of keeping with the New Testament pattern of the priesthood of all believers.